Handball as a sports gained greater popularity in Australia following its exposure at the 2000 Olympics Games hosted by Sydney. In June 2004 Australia won the Oceania World Championship Qualification Tournament. This enabled Australia to compete in the World Menâs Handball Championship which was held in January 2005 in Tunisia. A few months after the 2005 World Championships, one of the Australian handballers logged on at the Croatian Crown website and found a picture of one of the Australian players in a game against Croatia, published on the website. This was subsequently forwarded and shared with the handball clubs, the wider Australian community, and family and friends overseas. [Refer to the page 'Croatia Takes Silver â Second in the World', third photo]. The player is Bevan Calvert, who was 18 years of age at that time of the World Championship. 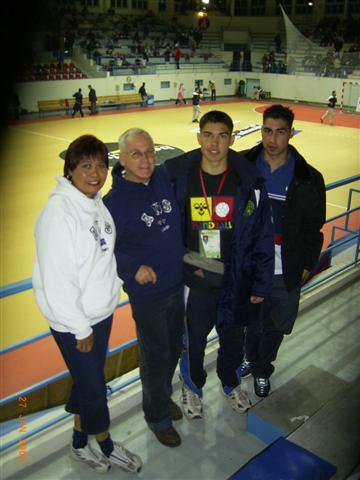 Bevanâs 'publicist', his mother Violi, sent a note of thanks to Nenad Bach, Editor-in-Chief of the website, for the acknowledgement of an Australian player. As part of the Croatian Crown websiteâs aim to promote world peace through friendship and understanding between people of all cultures, Nenad thought of featuring Bevan on this page. Bevan was born on April 4 1986 in Sydney and is the younger of two sons of an Australian father [John] and Philippine-born mother [Violi]. Like his older brother Tim, Bevan played soccer from when he was six years of age. Through the years, he took the role of team captain and received trophies for his commitment and achievements in the sport. When not playing soccer, Bevan was involved in basketball, cricket, tennis and swimming. His exposure to handball came about when the sport became one of the competition sports in high schools. 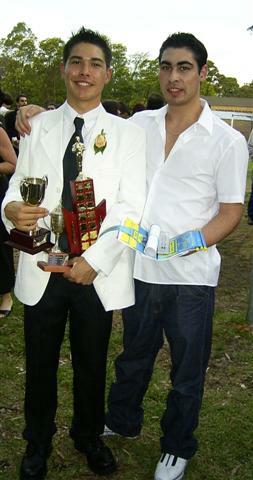 In 2001, the school attended by Bevan won the State Schools Challenge. In recognition of his achievements in the school and state level in handball, Bevan received the Philippine Community Council â Philippine Air Lines Youth Award in 2002. He was nominated for the award by the North Shore Filipino-Australian Association in Sydney, wherein his mother has been actively involved with. 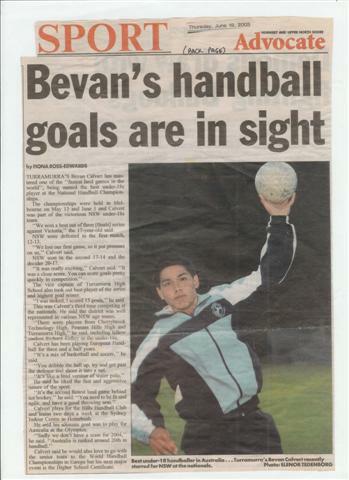 Following that, Bevan made it to the NSW u18's Team which won the Handball National Championship. 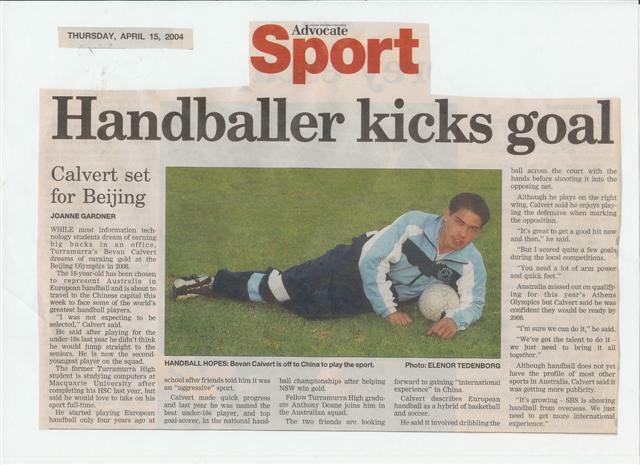 Three years later, Bevan was named in the Australian Handball Team. He was part of the Team which went to Beijing in June 2004 for a series of friendly games. Then in November 2004, he was named as part of the Australian Team to compete in the 2005 World Handball Championship which was held in January in Tunisia. There were 24 countries which qualified to compete in the World Championship. The Australian Team had a tough draw for their pool games - Croatia [defending champion], Spain [won 2005 title], Sweden, Argentina and Japan so was not able to progress in the championship. Nevertheless, they enjoyed the experience and the challenges of the event. On a personal level, Bevan did very well. He was the Australian Team's top scorer [15 goals] and was voted as the team's "Players' Player". As a student, Bevan was also very involved in various school activities. Aside from representing his school in sports events, he was nominated to attend the Global Young Leaders Conference held in Washington DC and New York in 2002. He was in the Students Council and was elected as Vice-Captain in his senior year. He also participated in a school stage play which showcased his 'unknown' singing and dancing skills. At his high school graduation, Bevan received a gold medal, Faculty Awards, and was named as Senior Sportsman of the Year. Bevan is currently undertaking a Bachelor in Information Technology at Macquarie University in Sydney, as well as doing part time work. Bevan continues to be involved in the handball club competition in Sydney. He enjoys both the competitive edge of the sport and the camaraderie amongst players. He credits a number of âhandball mentorsâ for their continued support. He shares a dream with his fellow handballers to represent Australia in the Olympics in the future. In the meantime, they have their sights on winning the upcoming Oceania Qualifying Tournament to be held in Sydney in May 2006 so they can compete in the World Championship to be held in January 2007 in Germany. It is also Bevanâs wish that one day he would have the opportunity to play handball professionally in Europe. As he is only turning 20 years of age in April this year, he has many years ahead of him to explore and fulfil this dream. Bevanâs 'publicist', his mother Violi, sent a note of thanks to Nenad Bach, Editor-in-Chief of the website, for their acknowledgement of an Australian player. From this, a friendship between Croatians and Australians albeit through cyberspace was forged. Bonjour ch&amp;amp;#232;re ami BEVAN j&amp;#39;ai tes prouesses &amp;amp;#224; travers ton site.Du fait que tu sois un passion&amp;eacute; du handball me motive &amp;amp;#224; m&amp;#39;associer &amp;amp;#224; toi.Je suis un jeune Camerounais pratiquant ce sport.J&amp;#39;aimerais en faire carri&amp;amp;#232;re dans ton ch&amp;amp;#232;re beau pays.